Flyer available - PLEASE POST!! Please post far and wide - school, store, laundro, car window, bicycle, work, dog, etc. * many more - email couleeprogressive@hotmail.com for table info or to sign up! For more than three decades David Morris has been one of the nation’s leading proponents for humanly-scaled, community-based economic and political systems as a prolific writer, speaker and advocate who has provided the basis for an extraordinary array of path-breaking policy initiatives. An economist by training with stellar academic credentials, David is a syndicated columnist and author of more than 200 books and articles on rural communities, energy and sustainability. He co-founded the Minneapolis and Washington, D.C.- based Institute for local Self-Reliance in 1974 and currently serves as its Vice-President and director of its New Rules Project. The Institute’s mission is to identify public policies that promote strong, locally owned and environmentally sound economies and to assist communities to move in that direction. Bill Moyers calls him "one of the nation's most innovative thinkers" and US Senator Paul Wellstone of Minnesota described him as "one of the nation's leading experts on sustainable development." Morris holds a PhD. from Union Graduate School (1976), an MA in Political Science / Latin American Studies from the University of Florida, and a BA in Industrial and Labor Relations from Cornell University. The Institute for Local Self Reliance (ILSR) is a small organization with a remarkable track record for breaking new ground in promoting sustainable communities. In 1978 RAIN magazine described ILSR as an organization that "puts hard numbers on soft dreams". ILSR was the first to systematically apply the concept of local self-reliance to urban areas. In 1980 ILSR was the first to investigate the energy conservation and solar energy potential for a major city (Baltimore) and was one of the first groups to formally testify before a utility regulatory commission in favor of investing in energy conservation as a cheaper alternative to new energy supplies. The city is posed to approve plastic recycling in La Crosse. This is a major step - for decades, the argument has been that the city's contract for waste to the "waste to energy" plant required as much burnable waste as possible to remain in the stream. However, with stricter pollution controls required and apparently a reduced plastic waste stream (where ARE all those water bottles going??!! ), more emphasis on recycling would be a good thing. However, more emphasis on not manufacturing/purchasing/disposing of plastics would be a better thing. Gubernatorial candidate Tom Barrett will be in La Crosse on Monday. State election law allows individuals to contribute up to $10,000 per year, corporate checks are not accepted. Contributions to Barrett for Wisconsin are not tax deductible. Join the local progressive community to share ideas, learn about what needs work and energize for the new year! We expect about 30 to 40 tablers at our ACTIVIST FAIR where you can sign up for a cause, debate a strategy or share an idea. A variety of soups and breads plus plates and utensils will be provided at our COMMUNITY POTLUCK but if you can bring a fruit or appetizer or dessert to share, that would be great! Cash bar. Our PROGRAM will include the annual Coulee Progressives Year in Review and we hope to have a speaker, too. ADMISSION is by sliding scale fee ($2 to $20). No one will be turned away for lack of funds, but remember, you'll get free food and a warm place to hang out for a few hours on a cold January night! If you can bring a NON-PERISHABLE FOOD ITEM for area food pantries, we will gladly accept and deliver it. 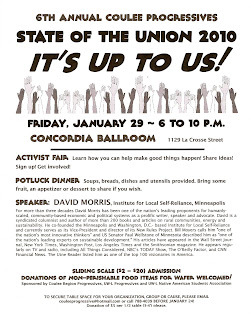 Sponsored by Coulee Region Progressives, UW-L Progressives and UW-L Native American Students Association. For more info about securing a table space for your group, organization or cause, please email couleeprogressive@hotmail.com or call 608 788-4039.